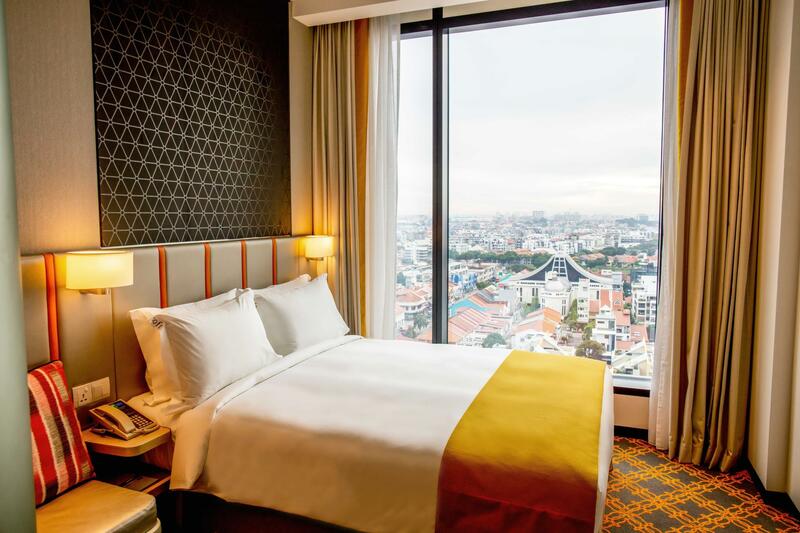 Το Holiday Inn Express Singapore Katong βρίσκεται στην ιστορική περιοχή Katong. Απέχει μόλις 5 λεπτά οδικώς από την παραλία Parkway της Ανατολικής Ακτής και διαθέτει σύγχρονα δωμάτια. Το κατάλυμα προσφέρει διάφορες εγκαταστάσεις και ανέσεις self-service. Οι επισκέπτες έχουν άμεση πρόσβαση στο εμπορικό κέντρο του ξενοδοχείου. Μπορούν να περάσουν την ημέρα τους στα καταστήματα του καταλύματος ή της γύρω περιοχής, να ασκηθούν στο γυμναστήριο και να απολαύσουν ένα ποτό στο μπαρ των εγκαταστάσεων. 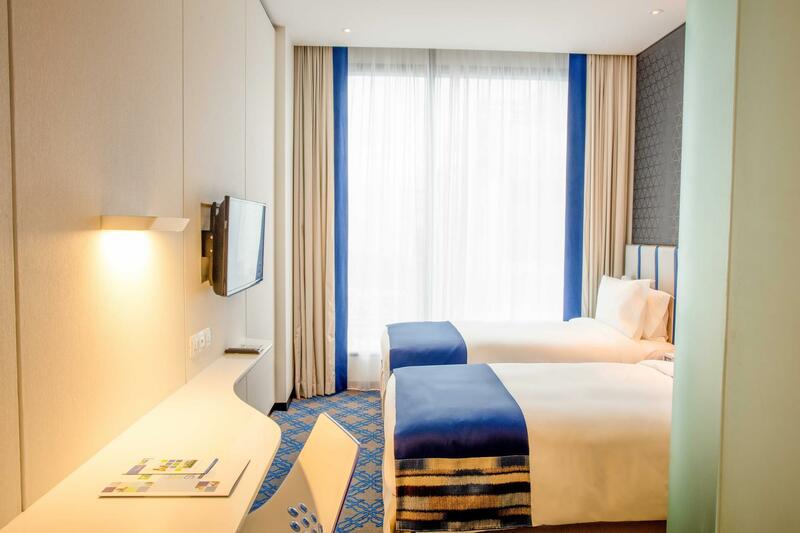 Το Holiday Inn Express Singapore Katong είναι χτισμένο στο σημείο του πρώην αστυνομικού σταθμού Joo Chiat, ακριβώς δίπλα στο εμπορικό κέντρο 112 Katong. Γύρω από το ξενοδοχείο θα βρείτε πολυσύχναστα καταστήματα, εστιατόρια και καφέ. Άλλα κοντινά σημεία τουριστικού ενδιαφέροντος περιλαμβάνουν το εκθεσιακό κέντρο Singapore Expo και το επιχειρηματικό πάρκο Changi, που απέχει 15 λεπτά οδικώς. Το στάδιο Singapore Sports Hub είναι προσβάσιμο σε 10 λεπτά με το αυτοκίνητο. Η μαρίνα Barrage βρίσκεται σε απόσταση 5χλμ., ενώ η Κεντρική Επιχειρηματική Περιοχή απέχει 15 λεπτά οδικώς. Το διεθνούς κλάσης Αεροδρόμιο Changi είναι 10χλμ. μακριά. Τα κομψά δωμάτια του ξενοδοχείου προσφέρουν θέα στη γύρω περιοχή και την πόλη. Διαθέτουν δάπεδο με μοκέτα, καθαρά λευκά είδη και απαλά μαξιλάρια. Σε όλα τα δωμάτια θα βρείτε καλωδιακή τηλεόραση επίπεδης οθόνης 32 ιντσών, ευρύχωρες ντουλάπες, θυρίδα ασφαλείας, παροχές για τσάι/καφέ και άλλα ροφήματα, καθώς επίσης μίνι ψυγείο. Ο μπουφές πρωινού σερβίρεται στο Great Room, το οποίο μετατρέπεται σε χώρο διασκέδασης μετά τις 11:00 καθημερινά. Το πολύγλωσσο προσωπικό της ρεσεψιόν είναι διαθέσιμο όλο το 24ωρο. Παρέχει υπηρεσίες check-in και check-out, καθώς επίσης δωρεάν φύλαξη αποσκευών. Το κατάλυμα προσφέρει στους επισκέπτες υπηρεσία πλυντηρίου, στεγνό καθάρισμα και παροχές σιδερώματος, χωρίς πρόσθετη χρέωση. Παρακαλείστε να σημειώσετε ότι οι δωρεάν υπηρεσίες πλυντηρίου, στεγνού καθαρίσματος και σιδερώματος είναι self-service. Σε αυτό το κατάλυμα επιτρέπονται μόνο ζώα-οδηγοί ή ζώα εργασίας. Για περισσότερες πληροφορίες, παρακαλείστε να επικοινωνήσετε απευθείας με το κατάλυμα. Τα στοιχεία επικοινωνίας αναγράφονται στην επιβεβαίωση κράτησης. Over all stay was very good. Fast wifi, clean bedroom and toilet, good breakfast and super accommodating staffs. Location was quite far from the MRT station. Need to ride a grab after riding the MRT. If given the chance, we'll stay again at Holiday Inn Express. When I check in to my room, we decided to change as we want to get some rest first. But as we are changing our clothes, another guest open the door!!! The hotel staff double release the same room to two different guests. This is such a serious mistake and how the hotel try to appease us is giving us a packet of coconut drink and extend my room stay by few more hours. Is this the right way to handle for such matter? No security, no safety, no privacy. Once entered the room, one of the free 2 bottled water was opened and (I believed) drank by the previous guest. The housekeeping obviously didn't do a proper job for sure. During breakfast the next day, the staff handled the muffin by bare hand!!! Emailed to IHG group and was told that the hotel will get back to me within 48hrs but no one is interested to call me back. This is definitely the worse IHG hotel I have stay so far. Breakfast buffet was sufficient. Enough to get your fill before a full day. Commute via bus or MRT is a bit hard, but you don't mind the expense of a cab or grab then location isn't really much of an issue. There's a lot of options as to where you can eat. There's also a mall right beside. Rooms were clean and size was sufficient for 2 people in the room. Counter Clerk (s) are very slow and it took more than 30 min to check in the room (even if there's no one waiting). One of the most comfortable beds I've ever slept on in a hotel. Location was excellent - no shortage of eating places within short walking distance. Hotel staff were nice and responsive to my needs. Very good breakfast that came with the room rate. It's a new hotel so everything is still quite new. Front desk staff were very pleasant, but the house keeping staff surprised me most. He/she might have noticed i drink a lot of water and gave me an extra bottle on the second day he/she made up my room. It was a small thing, but it was much appreciated. Apart from that, i noticed there's quite a lot of 'group check-ins' everyday. For the price, this place is hard to beat in terms of cleanliness and newness. Location is out of town but it’s a short taxi ride in, and you’re in a nice suburban area with lots of history. Definitely one of the parts of Singapore with a bit more character. Would stay again for sure. Hotel is good value for money for a quaint, quirky neighbourhood and a stone's throw away from the city (15 mins bus ride). Surrounded by lots of heritage eateries which represents the different ethnicities in Singapore. The property itself is pretty nifty - compact in size but no less clever and comfortable. Only none of near MRT station is the one negative point of the location. Beyond this, it is perfect. Room is spacious enough and well designed. Love the floor to ceiling windows. Clean and modern. Beds and linens are so comfy. We got the Queen standard which includes a Handy Mobile unit with free unli data and international calls to certain countries. Great value as we didn't need to purchase sim for mobile data as we toured around. Electric plugs in the room are universal and there's also USB slots by the desk. There's a bluetooth speaker/alarm/radio too and a Smart TV with cable and Youtube (video categories are preselected tho so you can't search). Hassle free check-in and check-out. Good breakfast. Great staff. Affordable rates. Situated in Katong, neighborhood is peaceful and quiet. Internet is fast enough for streaming. Has 24-hr gym and self service laundry. Beside a mall, 7-11 also nearby. No nearby train station but bus stop at Roxy sq. is only 250m away from hotel so mostly commuted via bus. Looking forward to stay with them again! The hotel was cleaner, more modern than we expected from the pictures and website. We were impressed by the helpful reception girls at the front desk for answering questions, helping us with transportation and calling for fixed rate taxis for us. The included breakfast was good. We got checked in early at 9 am after disembarking from the cruise ship, which was very good for us as we can go off to explore the city right the way without worrying about the luggage. Thank you, Phyllis (Front Office) for surprising my daughter with a delicious piece of birthday cake. The only let down was the food served at Baba Chews. We were looking to delight ourselves with authentic Peranakan cuisines. The soup has a fishy aftertaste. The pongteh lacks the spice, cinnamon. The only dish we were pleased with is kapitan curry. Overall, we were both pleased with the location, convenience, accessibility and cleanlinesd of this hotel. Keep up the good work, Holiday Inn Express Katong. 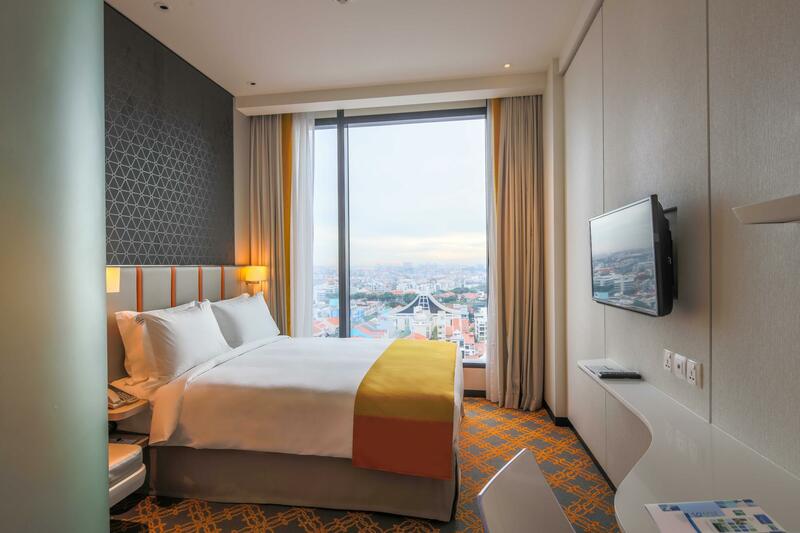 Great location between city & airport, it's suitable for business traveling. The nice breakfast are included which is good. The room are clean, staffs are nice and helpful. Plenty of local food options are available in surrounding, Definitely one of the choice if traveling to Singapore, Would stay again for sure! Booked last minute and was pleasantly surprised to find a name brand like Holiday Inn was reasonably priced (even for Chinese New Year week!). Checking in was no hassle, even offered us complimentary late check out. Complimentary breakfast buffet was good, could have been better with a wider selection, but the food they had available tasted great. Staff was very friendly and helpful, even allowed us to refill fresh milk for our toddlers bottle before starting our sight-seeing in Singapore. The surrounding area is packed with pubs and places to eat. Will recommend everyone to check out Sin Hoi eating house down the road (about 5 minute walk). The food is so good. Overall, will definitely be coming back to Holiday Inn Express Katong the next time we go to Singapore. Recommended! Breakfast spread was good, room was clean and tidy and hotel staff was accommodating. Requested for late checkout and was given till 2pm, appreciate that. Definitely would come back! We had 2 nights and truly enjoyed the cleanliness and quiet not to mention the view from our 16th floor! Definitely recommend to travellers who need to be near the airport ,20 mins by taxi. Good location for good food and near to the sea. The hotel was everything we needed out of a short, comfortable stay. The room wasn't big but it was roomier and cleaner than most boutique hotel rooms. The loo had a bidet. Huge plus. And free breakfast for all! The spread was generous for a non-five star buffet. We were very very satisfied. If not for the flung off location far away from where my fiance and I work, we'd stay here more often. Σταθμός MRT Eunos στα 1.7 χλμ.